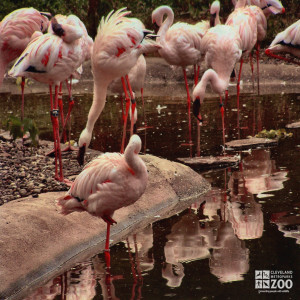 The lesser flamingo is the smallest of flamingos at about 31 inches tall (the male somewhat larger than the female) and weighs about 4 pounds. It has crimson blotches on its outer wings and black under feathers. It has a bright red beak and feet. The neck and legs are longer in proportion to its body than any other species of bird. The 3 front toes are fully webbed , and its hind toe is elevated. It has a unique bill: the lower beak is the larger of the 2 and the upper beak fits into the lower like a lid. Broad areas of the beak have fine comb-like teeth (lamellae). 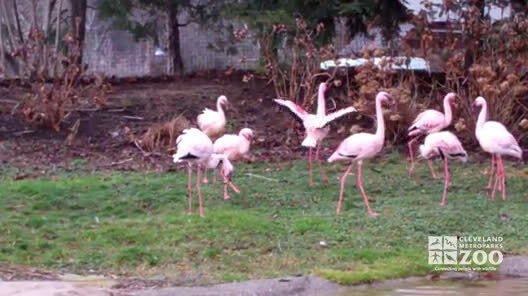 This is the most numerous of all flamingos. The young are grayish brown when born and do not look like an adult for 3 to 4 years. The lesser flamingos' range is the Great Rift Valley of East Africa; also found in Northwest India. The habitat of the lesser flamingo is salt and soda lakes and ponds. The egg hatches in about 28 to 32 days. The lesser flamingo flies with others in long skeins with its neck straight out and its feet trailing. It is very vocal in flight, honking much like geese do. It has few predators since it lives in such inhospitable places. Both male & female share in building the nest which is cone shaped, a foot high, hardened mud mound with a concave depression in the top for the egg. It uses its unique bill to feed in the water with its head upside down. It keeps the mandibles still and slightly open as it sweeps the beak through the top 3-4 inches of water. 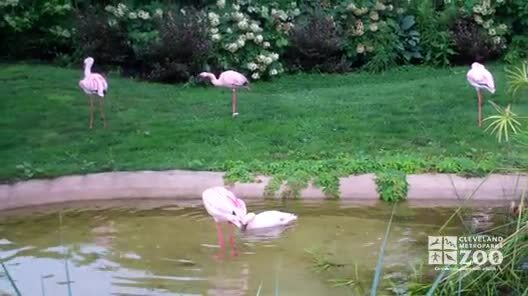 Some lesser flamingos pair for years while others take a new partner each breeding season. They may not breed if food is in short supply; breeding takes place in the fall. It begins as a group of 20 - 50 engage in ritualistic activity, eventually pairing off for more posturing. Copulation takes place while bathing. Both take turns incubating the egg. The new chick is able to leave the nest 4 to 7 days after hatching. Both parents feed their chick a "milk" that is secreted from their crop gland; it is about 15% fat and contains a large amount of canthaxanthin (the pigment that colors the feathers). Parental feeding continues for about 3 months, after which the chick can feed itself. Blue-green algae, phytoplankton from upper 3 inches of water. Ground spinach, carrot juice, synthetic canthaxanthin, carotene rich foods.